The Furry 5K is so much more than just a fun run/walk. Hero with his forever human, So. He’s absolutely fantastic – the best dog I’ve ever met. Hero’s the therapy dog at the office, with people from other floors coming to meet him (and he greets right back with a smile!). He’s even won over several folks who were apprehensive about pit bulls. We checked in with Hero’s former foster mom and asked Christy about her experience fostering Hero and what the Furry 5K means to her. Why did you want to foster Hero? SAS wanted to follow up on his heart murmur and put Hero on the foster list so that a volunteer would be able to take him to vet appointments. He would have a comfortable place to stay while SAS awaited test results and decided on further treatment, if that were necessary. Our 14-year-old Chow Chow mix, Kobe, who had been our first foster dog from SAS and also a “foster failure” when we adopted him, had died, but we weren’t ready to get another dog of our own. So, fostering was a good fit for us at that time. How was your time fostering Hero? Hero was an exceptional dog. He was the kind of dog everybody wants, sweet, snuggly and friendly to all people and dogs. He was also what we call “bomb proof.” Nothing made him nervous or scared. Everything and everybody made him happy. So he was a very easy foster dog. It was a pleasure to take him to his vet appointments because he charmed the pants off every vet and vet tech he met. Have you fostered from the SAS before? Yes, five dogs. Our Chow Chow mix, Kobe, was our first foster. We fostered another very happy Pittie named Manny, and very sweet and neglected Chow Chow called Jazzy, who had been seized in a cruelty case. Then Hero, then a little puppy SAS received in a transfer through Georgia Peaches Puppy Rescue called Ueli. We have also sat for a number of foster dogs when their foster parents went out of town. What was your favorite moment with Hero? Sleeping in and snuggling with him. We both enjoy sleeping in, and he was a champion snuggler. How can the Seattle community help dogs like Hero? Walk or run the Furry 5K, or donate online to the Help the Animals Fund, which pays for vet care. Hero may not have been adopted so quickly if SAS hadn’t been able to pay for the echocardiogram that let us know that his heart murmur was very low grade and should not give him trouble. What does the Furry 5K mean to you? It’s about the animal-loving community in Seattle coming together to help our city’s orphaned animals. I volunteer at the event every year, and it’s always a blast! If you can’t walk or run the course or donate to the HTAF, consider volunteering. The Furry 5K is coming up on Sunday, June 11, at Seward Park in Seattle. Visit www.furry5k.com to register or donate or for more information. Race-day registration begins at 10 a.m., and the run/walk begins at 11:30 a.m. We look forward to seeing you there! Even if you park your car in the shade, the sun’s movement can quickly put your car in your direct sunlight. Spring weather has finally appeared for Seattle, which means open windows and more time outdoors. As people start to enjoy time outside with their pets, the Seattle Animal Shelter is reminding pet owners that, even on 70-degree days, it is not safe to leave their furry loved ones in vehicles. Even if the ambient temperature is cool, studies have shown it’s a sunny day that can cause a car’s interior temperature to rise by an average of 40 degrees within an hour, said Ann Graves, Seattle Animal Shelter acting director. A 2015 Washington state law makes it a violation just to leave an animal unattended in a vehicle or enclosed space, if the animal could be harmed or killed by exposure to excessive heat or cold, lack of ventilation or lack of water. Penalties under this law are in addition to potential animal cruelty charges. Graves reminded the public that the shelter’s humane law enforcement officers responding to calls about animals left in hot cars will utilize all means necessary to access vehicles to remove the animals if they believe the animals are in distress. Never leave your animal tethered or kenneled in direct sunlight. Provide a shady area for retreat, such as a dog house, porch or shady tree, and always provide access to cool water. If you leave animals indoors, open screened windows, keep a fan running, provide plenty of water and, if possible, leave them in a cool location. If you see an animal that may be in need of assistance, or if you have questions, contact the Seattle Animal Shelter at 206-386-PETS (7387). Information is also available online at http://www.seattleanimalshelter.org. It’s a guinea pig invasion! It was guinea pigs galore on Tuesday, when nearly 100 guinea piggies arrived at Seattle Animal Shelter. It started about three years ago with one pair of guinea pigs – a male and female. In time, it became an unimaginable 250 guinea pigs, all in one couple’s Eastern Oregon home. The couple surrendered all the animals and we’ve been working with the Blue Mountain Humane Society in Walla Walla to help transfer many of the guinea pigs to find homes in Western Washington. Guinea pigs can quickly reproduce. Spaying and neutering is for more than just cats and dogs – yes, guinea pigs can be neutered. When spaying and neutering is not an option, guinea pigs should be separated by gender. If you find yourself with a growing critter (or any other animal) population, reach out to your local animal shelter for help before becoming overwhelmed. When considering adding a critter to your family, opt to adopt from your local animal shelter. We’re happy to have been able to partner with Blue Mountain Humane Society and other animal welfare organizations to help these animals in need. The Seattle Animal Shelter “Protect Your Pet” licensing and vaccination clinic is on a new schedule. Beginning this month, the clinic will be open every third Saturday, from 10-11:30 a.m. These monthly clinic events are hosted in partnership with Good Neighbor Vet, which provides the vaccinations in its mobile unit. This month’s clinic takes place on Saturday, March 18 in the shelter parking lot at 2061 15th Ave. W.
Cats and dogs are required to be licensed and vaccinated against rabies under Seattle Municipal Code 9.25.050 and Washington Administrative Code 246-100-197. One- to two-year pet license fees range from $24 to $70 for spayed and neutered pets and $75 to $200 for unaltered pets. To commemorate World Spay Day, this year taking place on Feb. 28, 2017, the Seattle Animal Shelter’s Spay and Neuter Clinic is offering free spay/neuter surgeries plus microchipping to area pets scheduled for surgery not just on that day, but that entire week – Feb. 27-March 3, 2017. Space is limited; to schedule an appointment, call 206-386-4260. This promotion is possible in part because of a generous grant from the Seattle Animal Shelter Foundation. These surgeries usually cost between $144-$186 for dogs, $102-$108 for cats and $90 for rabbits. While there is no residency requirement to take advantage of this special offer, pets of Seattle residents must be currently licensed or a license can be purchased on the day of the appointment. For altered animals, a one-year license is $24 for cats and $35 for dogs; a license is not required for rabbits. The Seattle Animal Shelter also recommends having your pet – dog, cat, or rabbit – microchipped while it is at the clinic for surgery. Microchips are invaluable for the peace of mind provided by this permanent means of identification should a pet ever become lost or stolen, said Dr. Zoulas. Dogs, cats and rabbits can be spayed or neutered when they are 4 months or older. Dr. Zoulas and her team are excited to again extend their World Spay Day promotion to include rabbits, the third most popular pet in Seattle. While clinic staff have been providing spay and neuter services to the rabbits adopted from the shelter for nearly 20 years, they only began providing this service to the public five years ago. Clinic staff are pleased with the enthusiastic response of rabbit owners to this program. In addition to the foundation grant, the Seattle Animal Shelter’s “Pet Population Control Fund” partially funds this year’s World Spay Day special. “Spay Day” is an international campaign of The Humane Society of the United States and Humane Society International. Each February, animal shelters and animal welfare agencies worldwide join forces to promote spaying and neutering of pets as the most effective and humane ways to decrease the euthanasia of homeless animals in shelters throughout the world. Donate to the “Pet Population Control Fund” at the Seattle Animal Shelter. This fund provides financial assistance year-round to pet owners who cannot afford the cost of spaying and neutering. It needs to be replenished constantly to maintain the clinic’s ability to provide resources to those in need. Please consider making a donation to the Pet Population Control Fund to help the clinic continue to save lives. Turn in a litter. As part of an ongoing Seattle Animal Shelter program, anyone who turns in a litter of puppies or kittens to the shelter is eligible for a free spay or neuter for the parent animal(s). In return, the shelter guarantees the adoption of the kittens and puppies, if they are adoptable. Talk to your friends, neighbors and family about getting their pets spayed or neutered. Year-round the Seattle Animal Shelter’s Spay and Neuter Clinic can help those in need with discounted or free spay/neuter surgeries. To obtain more information about Spay Day Seattle, to donate to the Pet Population Control Fund or to learn more about other Seattle Animal Shelter services, call 206-386-PETS (7387), or visit www.seattleanimalshelter.org. While you’re trying to stay warm early next week, don’t forget to also take proper precaution to protect your pets. That’s the message that the Seattle Animal Shelter is hoping area pet owners will hear as temperatures in the low 30s or colder are expected. To help those dogs that are left outside, the shelter is also soliciting new and used dog igloos and doghouses so that they may be redistributed to pet owners in need. Dogs and cats can get frostbitten ears, noses and feet if left outside. Bring pets indoors during cold weather and take them out only when necessary. Pets love the smell and taste of antifreeze, and even a small amount can kill them. Clean up spills at once and be alert for antifreeze on the ground or left out in open containers that have not been properly stored or disposed of. If your dog must remain outside for a period of time, provide an elevated dog house with clean, dry bedding and a flap over the opening to keep drafts out. The door should face away from the west or north to avoid cold winds. If you have a garage, consider installing a “doggie” door so your pet can seek protection from cold weather. Check water bowls to make sure they are not frozen and avoid using metal bowls, as your pet’s tongue could stick to the frozen metal. Gently towel or blow-dry your dog or cat if he or she gets wet from rain or snow. It is important to dry and clean paws as well. This helps avoid tiny cuts and cracked pads. Remember that chemicals used to melt snow and ice on driveways and sidewalks can burn your pet, so check the paws, mouth and belly after a walk. Make sure your pet has a current Seattle pet license and always use a leash. When walking on snow, dogs can lose their scent and easily become lost. A pet license is your best insurance your pet will be returned to you. Cats and kittens often nap on warm car engines and hoods. If your car was recently used, knock on the hood or honk the car horn before starting the engine. Help your elderly or arthritic pets when they need to go outside. Consider a sweater for short-coated breeds, such as pit bull-type dogs and Chihuahuas, before taking them outside. But choose wisely. Sweaters made from certain fibers don’t insulate when they get wet and can actually remove heat from an animal’s body. Avoid sweaters made of cotton; wool and some synthetics provide insulation, even when wet. Do not leave your pet alone in a car. It gets too cold and can quickly become a freezer, causing hypothermia and possibly death. Be careful of fireplaces and portable heaters. Keep fireplaces screened and heaters out of reach, as pets may chew the cord or knock it over and cause a fire. Like people, dogs and cats are more susceptible to illnesses in the winter. Take your pet to your veterinarian if symptoms occur. Dog igloo and doghouse donations may be delivered to the Seattle Animal Shelter at 2061 15th Ave. W., Seattle, WA 98119. The Seattle Animal Shelter is open Tuesday through Sunday, noon to 6 p.m. for adoptions and licensing. For more information, call 206-386-PETS (7387), or view animals available for adoption online at www.seattleanimalshelter.org. Do you need to license your cat, dog, goat or pig? No late fees or penalties in October! This month, pet owners in Seattle can take advantage of a “license amnesty period” to bring their expired pet licenses up to date or purchase new tags for animals not currently licensed, and the city will waive late fees and other penalties. The easiest way to purchase or renew a pet license is online at www.seattleanimalshelter.org, said Ann Graves, Seattle Animal Shelter acting director. Pet owners can also obtain or renew a license through the mail or at numerous locations throughout Seattle, including the shelter, located at 2061 15th Ave. W., and the city’s customer service centers. Visit http://www.seattle.gov/animal-shelter/license/purchase-or-renew-a-license for a list of payment locations. Graves explained that many people are unaware how a pet license helps to save other animals’ lives. Pet licenses also benefit individual pets. A pet license tells the finder of a lost pet or the shelter that the animal is owned and not a stray that should be kept or adopted out, said Graves. The tag provides the shelter’s phone number, giving a good Samaritan an easy way to help without having to find a microchip scanner. And shelter officers that encounter lost pets will use license information to contact owners immediately and many times give those pets a ride home. More information about Seattle pet license fees is available online at http://www.seattle.gov/animal-shelter/license/licensing-fees. The Seattle Animal Shelter, located at 2061 15th Ave. W., is open Tuesday through Sunday, noon to 6 p.m. for adoptions and licensing. For more information, call 206-386-PETS (7387), or view animals available for adoption online at www.seattleanimalshelter.org. When temperatures soar – as they are expected to do in Seattle late this week and over the weekend – the hot weather can create hazards for pets. The Seattle Animal Shelter is reminding pet owners to take proper precaution this weekend, and, for those attending the annual Hempfest event, please leave your pets at home. Pets, besides service animals, are not allowed at Hempfest. 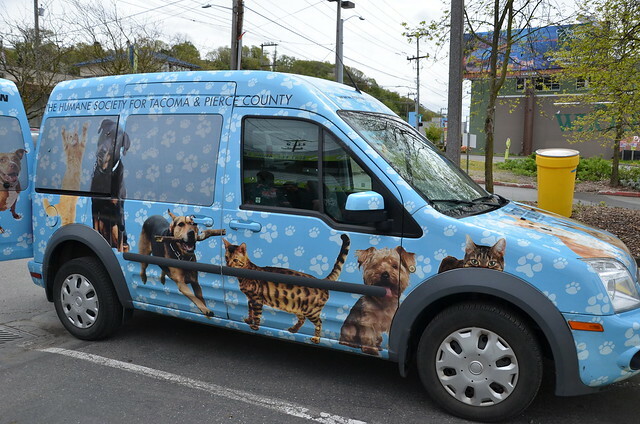 There is no safe place to leave or secure pets at the event, and the Seattle Animal Shelter warns pet owners against leaving animals in vehicles. Cars in direct sunlight can reach fatal temperatures within just a few minutes, and on hot days, even dogs left in the shade with the windows cracked are at risk of brain damage or death. The shelter also reminds pet owners that a Washington law that went into effect in 2015 makes it a violation just to leave an animal unattended in a vehicle or enclosed space, if the animal could be harmed or killed by exposure to excessive heat or cold, lack of ventilation or lack of water. Penalties under the new law are in addition to potential animal cruelty charges. The Seattle Animal Shelter’s humane animal law enforcement officers responding to calls about animals left in hot cars will utilize all means necessary to access vehicles to remove the animals. If you are bringing your service animal to Hempfest, the shelter reminds you to make sure it is not exposed to toxic substances and be sure that it has access to plenty of water during the festival. Never leave your animal unattended in direct sunlight. Provide a shady area for retreat, such as a dog house, porch or shady tree, and always provide cool water. If you leave animals indoors, open screened windows, keep a fan running, provide plenty of water, and, if possible, leave them in a cool location. Never leave animals unattended in a vehicle. Animals do not perspire like humans; they cool themselves by panting. Seats in vehicles get hot under animals’ feet and prevent them from perspiring through their paws. Temperatures rise quickly leaving them trapped and unable to escape the heat. If you must travel with your pet, carry water. If a trip requires you to leave your pet in the car at any point, think about saving that for another day. It’s not worth the risk. Avoid overexerting your animal in hot weather. Exercise is fine when taken in moderation, but extreme heat conditions, obesity, old age, breed and underlying disease can predispose an animal to the risk of heat exhaustion and heat stroke. If you see an animal that may be in need of assistance, or if you have questions, contact the Seattle Animal Shelter at 206-386-PETS (7387). Visit www.seattleanimalshelter.org for other shelter information. For many people, Fourth of July is one of the most celebrated days of the year, a time to enjoy backyard barbecues and fireworks lighting up the sky. While fun for people, these holiday festivities create potential hazards for pets. The Seattle Animal Shelter encourages you to make July Fourth activities safe for the furry members of your family by offering a handful of holiday tips. Keep your pet indoors. The noise from fireworks can be frightening to animals and may cause them to seek safety. Don’t bring your pet to a fireworks display. Crowded, unfamiliar and loud places can cause undue stress on animals. If you are going to a fireworks display or an event where fireworks will be used, the best action is to leave your pet at home. Protect your pet from the heat. Holiday weekend weather is forecasted in the mid-to-upper 80s. Do not leave your pet in a car, even in the shade, and make sure your pet has access to cool water. Be careful not to overexert your pet. Make sure your pet is wearing proper identification, such as a current pet license. If a lost pet wearing its license is brought to the Seattle Animal Shelter, the owner is notified immediately via telephone. If an officer finds a licensed pet in the field, it will be returned to the owner, instead of taken to the shelter. Don’t feed your pet scraps from the grill. While it can be very tempting to share your holiday treats with your pet, it’s best to keep your pet on its normal diet. A change in diet can upset your pet’s digestion, and some human foods are toxic for some animals. The Seattle Animal Shelter will be closed on Monday, July 4. If you find a stray animal, please care for the animal until the shelter reopens on Tuesday, July 5. As humane law enforcement officers will not be available during the closure, for any life-threatening situations call the Seattle Police Department at 911. Seattle will get a glimpse of summertime weather this weekend and into next week, with expected temperatures ranging from the high 70s to mid-80s. While we can seek out fresh air and a cold drink to cool down, our pets rely on us to make sure they are comfortable and safe. The Seattle Animal Shelter is reminding pet owners to exercise good judgment and use common sense when it comes to protecting their pets. As many homes in the Northwest aren’t equipped with air conditioning due to our normally moderate climate, people leave their windows wide open during warm weather. The fresh air is essential to you and your pets, but be aware of the enticement and danger an open, screenless window can pose for cats. Jordan also warned pet owners against leaving animals in vehicles. A Washington state law that went into effect last year makes it a violation just to leave an animal unattended in a vehicle or enclosed space, if the animal could be harmed or killed by exposure to excessive heat or cold, lack of ventilation or lack of water. Penalties under this law are in addition to potential animal cruelty charges. Jordan said that the shelter’s humane law enforcement officers responding to calls about animals left in hot cars will utilize all means necessary to access vehicles to remove the animals.